WASHINGTON — President-elect Donald Trump has chosen South Carolina Gov. Nikki Haley as U.S. ambassador to the United Nations, the first woman tapped for a top-level administration post during his White House transition so far. It will be a Cabinet-level position, and Haley has accepted. Haley, an outspoken Trump critic throughout much of the presidential race, would become his first female — and first nonwhite — Cabinet-level official if confirmed by the Senate. She’s the daughter of Indian immigrants and is the second Asian-American to serve as a U.S. governor. ‘‘Our country faces enormous challenges here at home and internationally, and I am honored that the president-elect has asked me to join his team and serve the country we love as the next ambassador to the United Nations,’’ Haley said in Trump’s release. After secretary of state — a job Trump has not yet filled — the ambassadorship is highest-profile diplomatic position, often serving as the voice for U.S. positions on the international stage. As part of the Cabinet, Haley would have more opportunity to shape U.S. policies, rather than simply defend the administration’s positions. Yet it could be an awkward role at times. Trump campaigned on the theme of ‘‘America first’’ and said he is skeptical about ‘‘international unions that tie us up and bring America down.’’ Trump has also described the United Nations as weak and incompetent. 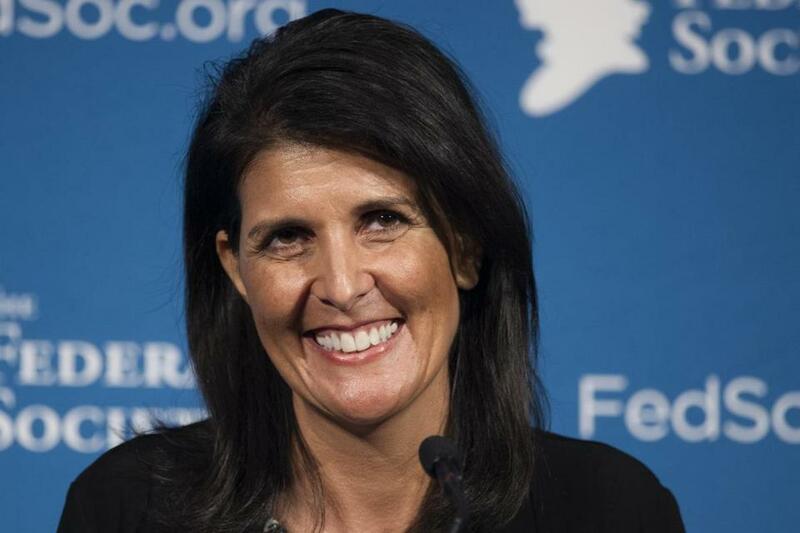 Haley would be the third consecutive female U.S. ambassador to the United Nations, after Susan Rice and Samantha Power, the current ambassador. Haley’s new job clears the way for Lt. Gov. Henry McMaster to step into the role of South Carolina governor. McMaster was an early Trump endorser, backing him before the state’s GOP primary in February. At the time, Haley campaigned for Florida Sen. Marco Rubio, before going on to support Texas Sen. Ted Cruz. Still, Haley met with the president-elect last week at Trump Tower. Afterward, she said they'd had a ‘‘very nice’’ conversation. Associated Press writer Gary Fineout contributed to this report from Miami.